Basketball Game is a popular game globally and now it is gaining the popularity among the Indian sports lovers and young sports champions. Basketball shoe is an important part of basketball game. 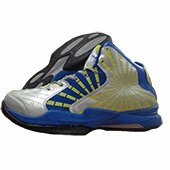 A good pair of basketball shoe will help player to enhance the game and player can perform better with perfectly selected shoe. 1. Helps in improving footwork movement within the Basketball court. 2. Comfortable shoe helps in improving the game skills. 3. Perfectly designed shoe outer sole can improve the traction force, thus it can improve the player dribbling skills. 4. High Quality upper materials of basketball shoe can improve the Breathability of shoe by which player will feel refreshed during long basketball games. 5. Well cushioned Mid Sole helps in providing shock absorbing ability and avoid the injuries during intense game. Point 1: Determine the Playing Level (All-round type Players) : Player with all-round type of game style required unique combination of cushioning and traction force. All round type of player need a shoe with moderate cushioning while they required excellent traction force. To get good traction force from shoe, players need to check the outer sole. Outer sole must be of good quality rubber material with excellent grip patterns. Nowadays, Shoes are coming with good grips. In Medium price range, Nivia shoes are good option for all round type of players. Point 2: Determine the Playing Level (Fast Players) : Player with fast game playing style required very light weight shoe with excellent outer shoe profile. Shoe should equip with lower cut shape profile to give more stability during fast run in basketball court. Lower Cut shoe configuration give better stability and lightweight shoe type. With Very Light weight shoe, basketball player can effectively run and dribble in court. Point 4: Construction of Shoe (Upper Part) : Upper Part of Basketball shoe gives protection and keep shoe stable during basketball game. Buyers need to select the shoe with high quality upper material but it will cost to more. Upper shoe material should be durable and breathable in nature so that it maintains the freshness of shoe during intense game play. Nowadays, manufactures are producing the upper material with the composition of leather and synthetic mesh. Leather material gives durability with synthetic mesh give breathable and flexibility. Laces : Laces closure system is very common in basketball shoes. It give perfect lacing system while offers good stability to players. Players also get flexibility to loosen and tighten the shoe as per game need. 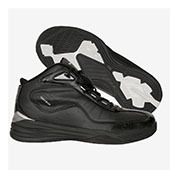 Straps : Few Basketball shoes come with strap that wraps around the upper arch of which gives protection against ankle rollover and gives more stability. Some shoe also offers combination of Laces and Straps. Point 5 : Construction of Shoe (Mid Sole) : Mid Sole is an important part of basketball shoe as it absorbs most of the body weight and impact forces. Mid sole is a layer between upper and outer sole. Mid sole is made of EVA, compressed EVA, polyurethane or a combination of these materials. Some brand done most of its research on mid sole material and produced latest technology in mid sole.EVA gives light weight cushioning material but player needs to compromise on durability while of other hand, PU (Polyurethane) offers good cushioning and gives best durability. Point 6 : Construction of Shoe (Outer Sole) : Outer sole material of basketball shoe must be durable in nature and should equip with perfect shape and gripping pattern to provide you best traction force. Most of the basketball shoe sole is equipped with herringbone pattern which gives optimized traction force required in basketball game with motion control factor. The outer surface of basketball shoe must be flat for provide basketball player stability and control. Point 7 : Traction Force from Shoe Sole : Traction Force from basketball shoe is very important parameter. Traction force is the force used to generate motion between a body and a basketball court surface or any tangential surface. Traction force is required by Basketball player in order to get better movement and speed in the game. Outer sole players key role in generating the traction force. Players need to select the shoe by optimized traction force. Sole outer surface should equip with better material and flatter surface to get better traction force.